More on the recently confirmed PlayStation 4 title. 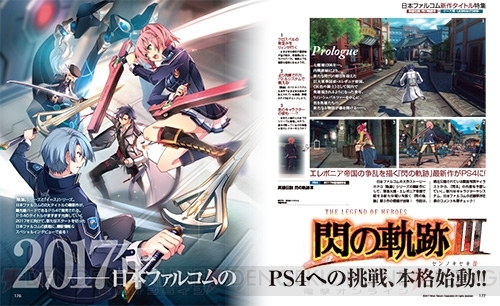 The latest issue of Dengeki PlayStation has an interview with Nihon Falcom president Toshihiro Kondo on the newly revealed The Legend of Heroes: Trails of Cold Steel III, due out for PlayStation 4 in Japan in 2017. “The fundamental parts will not change, but one of the issues of command battles to be dealt with is that the battle progression seems slow. Since we’re on PlayStation 4 and have buttons, we thought why not directly assign [actions] to each button, so that’s what it became. It’s still in development, so it’s not yet fixed if it will be as you see it, but we’re shooting for something intuitive that progresses with the simple push of a button. “Also, we’re thinking about a format that seamlessly shifts to battles from the map. Movement is as it was before, and your positional relation is important. We’re trying to properly preserve the idea of distance, such as being surrounded, at times you’re back-attacked. Thanks, Hachima Kikou and Dengeki Online.